Last March, Sanju and I attended a lechon degustacion dinner at Dedet de la Fuente’s private home kitchen in Makati. We weren’t quite sure what to expect at this dinner but we made sure we brought our appetites. The dinner consisted of several courses, all of which are Dedet’s family favorites. Between bites, each course was carefully explained by Dedet to the guests , gives us a story of how she learned to make lechon. 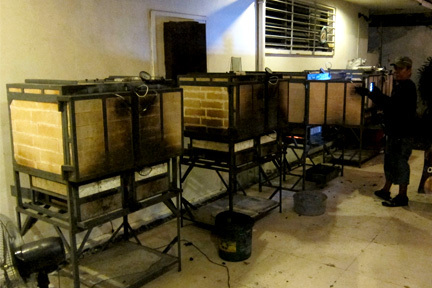 It took her 6 years of waiting before being able to attend a lechon making class using a pugon (hearth oven). A class takes place just once a year; with the classes not usually pushing through because of lack of students. (It just takes 5 students to open a class.) But Dedet was so determined to take the lesson one year that she enrolled her daughter’s yaya (nanny) just to fill the slot and persistence finally got her what she wanted. 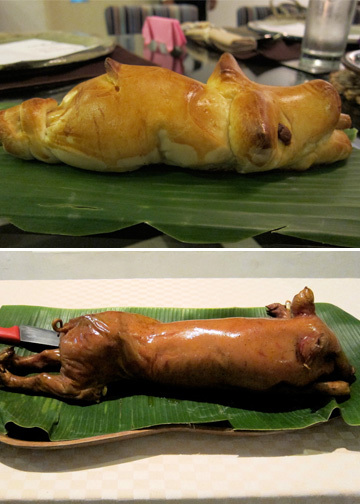 The first lechon she created for public consumption was the lechon stuffed with binagoongan rice. Funny how all the guests gasped when we found out that it was not part of the evening. Nobody complained after we learned that we were going to consume 4 lechons for dinner. If that wasn’t rich enough, the courses between the lechons were just as lethal. Like the Pinoy Carbonara; a cream based pasta topped with crushed chicharon! We had the following for the night: Pinoy Lechon (lechon de leche stuffed with spicy sisig rice). German Lechon (lechon de leche stuffed with roasted garlic and potatoes). 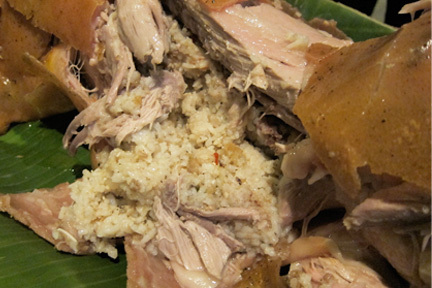 Chinese lechon (lechon de leche stuffed with chestnuts and machang style rice). And the French lechon (lechon de leche stuffed with truffle infused rice). Each lechon had the same crisp skin and tender meat, some guests even recorded the sound of the knife cutting through the skin. 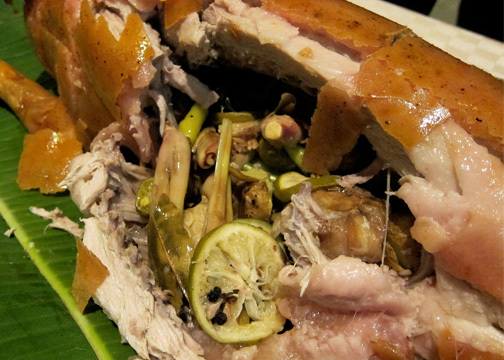 The idea of an all in one stuffed lechon is brilliant, but customers may ask to order the lechon just on its own. The lechon can stay crisp up to 6 hours. This has got to be one of the best dinners put together. It lasted for almost 4 hours; despite the amount of food we had, it was paced well. The guests got along quite well, too. Private dining is increasingly popular these days, and this one is not to be missed. It’s intimate and the perfect setting to gather friends together. Call (02) 4254605 to reserve a table. Well written. I'm drooling now. I never knew you can make lechon in so many ways. And it's also the first time I'm hearin' that they also make it with stuffed rice :) Sanju...you and C must take me there when I visit.